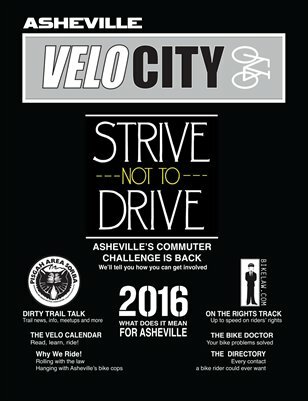 Velo City is a new bi-monthly magazine dedicated to bike riding in the Blue Ridge Mountains of North Carolina. Here in Asheville, we are blessed with some of the best riding in the country, if not the world. We have a huge biking community and we are the premier destination for a growing legion of vacationing bike riders. It is our aim to give voice to the mountain pedal revolution. Velo City will introduce you to the majestic beauty of the Blue Ridge Mountains both on and off road and assist you in every aspect of your ride. Interviews, information, insights into the world of bikes. It's all here. So, turn a crank, take a cruise or climb a mountain. As they kinda' say, the revolution will not be motorized, but with the help of Velo City, it will be publicized!